Just as your business is constantly changing due to a variety of internal and external factors – some of which you can see on the horizon, and others that can emerge without warning -- your workplace design must also adjust in light of employee turnover and on-boarding, evolving organizational strategies, and new workflow requirements. 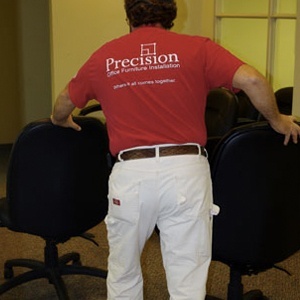 At Precision Office Furniture Installation, we’re recognized experts in every aspect of office furniture reconfiguration, from initial concept and planning, through to moving and re-installation. We don’t merely “move your furniture” from one location to another. We provide you with strategic recommendations and insights that enable you to maximize space utilization, so that you can optimize productivity, efficiency and employee engagement. We’ll work in accordance with your desired schedule in order to minimize or eliminate workflow disruption and downtime. Our team can work around your normal business hours, including early mornings, late evenings and weekends. We can also implement your customized office furniture reconfiguration plan in a series of stages. Your office furniture and equipment are valuable corporate assets, and must be handled with the utmost care. Every member of our team is highly trained, experienced, and adheres to professional moving standards. We’re also friendly, responsive and accessible -- which is what you should expect from your elite office furniture reconfiguration partner! We don’t believe that our job is done unless and until every last box, sheet of bubble wrap, or any other item involved in the reconfiguration project is cleaned up and cleared away. This may not seem important to note, but frankly, we’ve been told by our customers over the years that this was not always a top priority of their previous office moving partner. Be assured that it’s part of our commitment. We’re professionals -- and it shows. Call or email us today to learn more about our end-to-end office reconfiguration solutions. In the past several months while you have been working with First Financial Planners to accomplish this very difficult corporate relocation, your service has been extremely proficient. The Precision Team exhibited a willingness to accommodate our needs whether it meant your crew had to work late into the evening or rearrange furniture to fit individual needs. The crew that has worked on this project has been efficient, quiet, and competent which is important when those in the office must continue working while the reconfiguration takes place.